This free 68 page in-depth whitepaper takes a comprehensive look at SVOD market share trends around the world. 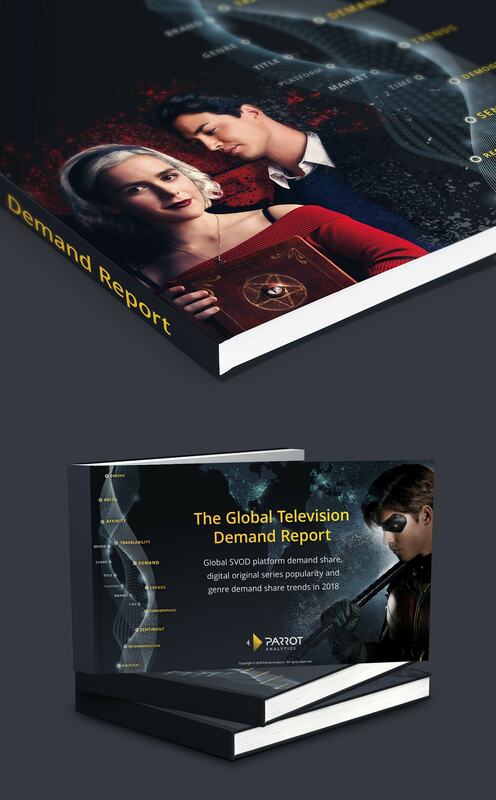 The Global Television Demand Report is published quarterly by Parrot Analytics and utilizes the full global TV analytics dataset, which is comprised of 3.5 trillion data points across 100+ languages in 100+ countries. We reveal the 2018 SVOD market share in each of the 10 markets for the major platforms including Netflix, Amazon Prime Video, Hulu and CBS All Access based on audience demand for each platform's digital originals. Discover how SVOD market share trends have changed over the last 24 months, including the contribution made by DC Universe. Find out what percentage of the market for drama and action/adventure digital originals each SVOD platform has managed to capture over the last 24 months. Learn where in the world content produced in each territory is the most wanted relative to the domestic home market; we refer to this as content travelability. Discover which sub genres resonate the most with local audiences compared to the global average. Find out what the demand distribution of a selection of digital originals in each of the ten markets looks like. Discover the top 20 digital streaming shows for each country, as well as 5 additional titles of interest in each market. Find out the 2018 global SVOD market share of the major platforms including Netflix, Amazon Prime Video, Hulu and CBS All Access across 100+ markets. Discover the worldwide platform demand share of all drama digital originals as well as the worldwide platform demand share of all action/adventure digital originals. The increase in the global investment made by SVOD platforms over the last 5 years. The global growth of SVOD subscribers over the last 5 years. The increase in digital original titles worldwide over the last 7 years. A TV industry update for 2018 detailing important market events concerning SVOD services. We have also included a mini analysis of the global demand for critically acclaimed digital original comedies. Note: We define "SVOD market share" as the share of demand for each platform's digital originals. "Content travelability" is defined as the global popularity of a title relative to its home market. "Digital Originals" are defined as a multi-episode series where the most recent season was produced or first made available on a streaming platform.